It can be frustrating and somewhat disappointing when your fluffy friend continually rejects the pet food brand that he or she had been fed with for a period of time. It is even more damning when they react badly to something they ate. In this article, we will discuss two brands, Fromm and Acana extensively. By the end you will know exactly which one is right for you furry little friend! After you are done with this awesome comparison, check out Acana and Fromm here to see the different flavors and pricing. The total health and immunity of your pets to diseases largely depends on the food they consume so it is important to be guided when shopping for pet food. The perk of purchasing popular pet foods is that you never have to worry if your pet is eating right or getting enough nutrients or if the diet is balanced enough because every pet food brand has a standard and a minimum and maximum nutritional requirement which is regulated by the AAFCO. This means that every pet food has been analysed and vetted by the regulatory body. Each product contains exactly enough nutrients for your pets daily sustenance as well as physical and mental development. So whether you own an energetic Golden retriever or an American Bobtail, you are sure that your pet food of choice provides more than enough for them to survive. We would review their brand history, nutritional components, ingredient quality, pricing, pros and cons and every other thing you need to know. Acana takes the lead as it provides more protein than Fromm. The difference is not alarming but it is notable. For the dry dog food category, Acana provides up to 7.14 percent more protein than Fromm food products. The result is the same in the cat food category. Acana food products is more protein-rich by 2.50 percent. Acana costs slightly higher than Fromm food products. The price difference between these two brands is not very significant. Fromm takes the lead in this category as it has almost double the number of flavours owned by Acana. While Acana has 49 flavours, Fromm has 84 flavours. Fromm has been recalled once whereas Acana has never been recalled. Check the current prices and recipes/flavors for Acana and Fromm. As presented on the table, Fromm has a wider variety than Acana; the difference in the number of flavors is very significant. Acana is more focused on natural food so they do not produce wet meals. As shown on the table, both brands do not have cat treats. One of the most important factors to consider when getting acquainted with a brand is its nutritional value. If a food brand performs poorly in this regard, you can conclude that it is not good for your pet. AAFCO has summed up the most essential nutrients into protein, fat, and fiber. You must check food labels to see the proportions that each brand provides. The table below provides this information for Fromm and Acana. As presented on the table above, Acana has better nutritional components than Fromm in all categories except fiber. For the dry dog food, it is only higher by an infinitesimal 0.1 percent. Fromm is also higher by about 1.4 percent in the cat food category. It is important to know the functions that these nutrients perform in our pet’s body. That way, we can appreciate the nutrients while shopping. A balanced canine and feline diet can never be short of protein. Your pets need protein to function optimally. Not only does it repair worn-out tissues, it helps build the body. Cats and dogs need essential amino acids, those that the body cannot provide independently. These nutrients are supplied by protein-rich meals. Protein is an indispensable nutrient. You will never need to worry about the look, taste and feel of your pet food if it contains fat. Fat provides more energy than carbohydrates and protein. It is an essential component of a balanced diet. Consumption of fats should be supervised as it can have adverse effects when taken excessively. Food must be well digested so that the body can absorb all the nutrients into the bloodstream, fiber makes this happen. With fiber, you do not need to worry about colon or gut health, digestion, weight gain or constipation. Understanding pet food price can be confusing. You can either buy on a “per pound” basis or on a “per calorie” basis. These metrics give different results depending on your shopping habits. The best yardstick for the average buyer is “per kcalorie (Kcal)” because food product is weighed without the moisture content. The table clearly shows that Acana is the more expensive brand as it costs slightly more when both metrics are applied. Lamb, Duck, Apple, Pear, Pork, Squash, Mackerel, eggs, wild-caught fish, fruits and vegetables, pumpkin, red meat, poultry among others. Check out the current Acana recipes and Fromm recipes here. This brand has been existent for over a century! Fromm family pet food started in 1904 and has been handed down five generations after. Fromm is not just a brand but a legacy. With a dry food plant in Wisconsin and a wet food plant in South Dakota, Fromm is reputed for producing personally formulated recipes. Their high-quality ingredients are sourced from the US and prepared personally by current owner, Tom Nieman who inherited the business from his grandmother in 1983. Fromm uses of natural and fresh ingredients to provide balanced and nutritious meals that would otherwise be fit for humans. Owned by Champion PetFood, Acana remains one of the most popular and highly reputed brands in the Pet food industry. Acana has its operations in the US and Canada. Their pet food is produced in their sophisticated kitchens and they have three major values. Their meals are meat-based, made with fresh, natural ingredients that are produced daily and never outsourced. Farmers, fishermen and ranchers supply these ingredients for biologically appropriate meals. 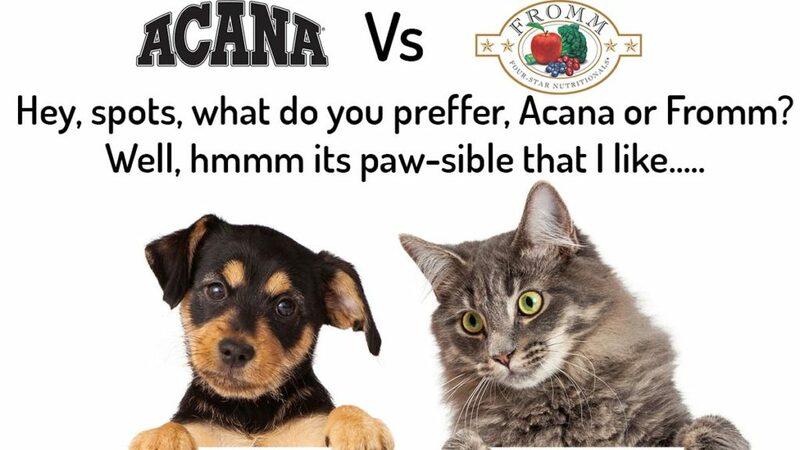 Acana is a brand that has gained the confidence of pet owners over the years because their products deliver indisputable results. March 14th, 2016 – Fromm recalled for incorrect vitamins and minerals. Acana has never been recalled. The winner for this review is Acana. While Fromm is almost as excellent in quality and promise, Acana provides more nutritious benefits. Acana is also more highly reputed for product safety as it has never been recalled. It suffices to say Acana provides value for money.